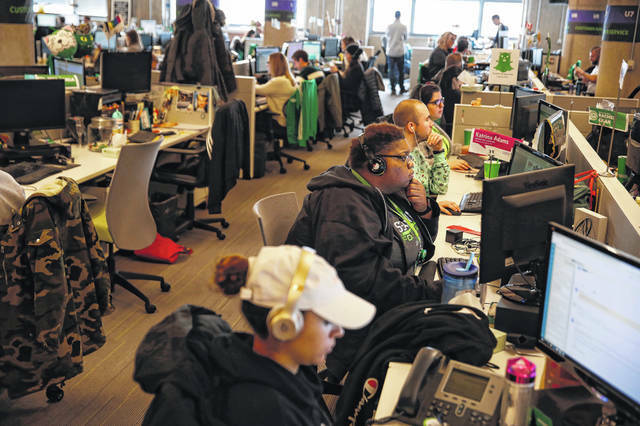 The customer service department at Groupon in Chicago handles customer requests on Nov. 14. The game-changing online company turns 10 as a smaller operation from its peak. CHICAGO — Groupon launched a decade ago this fall with a two-for-one pizza deal at Motel Bar in Chicago, a humble beginning that preceded a whirlwind rise and an even faster fall. The company became one of Chicago’s biggest tech success stories since the dot-com era. Even now, after years of shrinking, Groupon is still held up as a triumph of the city’s tech scene. It employs more than 1,500 people locally. Two of its founders — Eric Lefkofsky and Brad Keywell — rank among the highest-profile entrepreneurs in the city and have gone on to form billion-dollar tech companies that use big data to battle cancer and make heavy machinery more efficient. But the growth at Groupon was too much, too fast. Company leaders have spent the past several years trying to figure out what Groupon should be, backpedaling on growth and reducing the company’s reliance on those wry daily emails. Companies aren’t supposed to grow from $40 million or $50 million in revenue to more than $3 billion in a couple years, said Lefkofsky, a former CEO and current chairman. “Parts of the growth we handled really well, and other parts, in hindsight, we didn’t handle very well,” he said. Groupon became a household name with consumers. Small business owners usually came on board once they understood the group buying concept, said Sarah Greubel, director of sales for Things To Do, Groupon’s live events and experiences category. Greubel was employee No. 24, hired in May 2009 to launch Groupon in Atlanta and San Francisco. The first deal she launched in San Francisco was a $15 tour of San Francisco Bay with tour operator Adventure Cat Sailing Charters. The morning it went live, hundreds of the tours were sold before lunchtime. It was a wild time, filled adrenaline, fear and chaos, she said. Employees gathered deals that went live the next morning. It was relativity easy to replicate the business in each new city with the help of social media. Competitors also could mimic Groupon’s model, which created challenges for the company down the road. Groupon went international in 2010. That year, the company turned down a nearly $6 billion acquisition offer from Google, opting to go public the following year. Co-founder and then-CEO Andrew Mason rang the Nasdaq opening bell on Nov. 4, 2011, amid a shower of green confetti as Groupon debuted on the tech-heavy stock exchange at $28 per share — a price it hasn’t reached since. By 2012, Groupon was in almost 50 countries, and by 2014, annual revenue grew to more than $3 billion. During much of the company’s ascent, current CEO Rich Williams was in Seattle, working in marketing and advertising at Amazon and watching Groupon from afar. One day, a Groupon employee he knew asked for his thoughts on a commercial the company was planning to air during the 2011 Super Bowl. It was Groupon’s first foray into TV advertising, and Williams knew right away the commercial wouldn’t work, he recalled. “My feedback was, ‘Are you nuts? These are going to get you guys killed,’ ” he said. The ad started out like a pledge drive for Tibet, highlighting the human rights violations it had endured under Chinese rule. Then the commercial cut to actor Timothy Hutton, who said Tibetans “still whip up an amazing fish curry” and that he saved money at a Chicago Himalayan restaurant via Groupon. The commercial was widely regarded as a spectacular failure on advertising’s biggest stage, as many viewers felt it made light of the Tibetan people’s struggles. Scrutiny became a constant for Groupon when it filed for an initial public offering later that year. Before Mason ever rang the opening bell, analysts were picking apart the company’s financial statements, and Groupon had to amend its IPO documents several times. The company’s share price declined about 80 percent in its first year as a public company. Skepticism surrounded its ability to maintain revenue growth and the sustainability of its business model. Even the rise of its retail site Groupon Goods, which sells everything from towel sets to furnace filters, drew concerns about the transparency of the company’s accounting methods. Williams, who joined Groupon in 2011, moved through several positions before being named CEO in 2015, taking the helm from Lefkofsky. When Williams took over, he started to shrink and simplify the company. It went from operating in almost 50 countries to 15 and from a peak of more than 12,000 employees in 2014 to about 6,500 currently. Groupon reduced its dependence on email, narrowing it from all of the business to one-fifth. “We knew we had to do some things that were going to create noise,” he said. It increased the amount it spends on marketing, upped the number of deals it offers and rolled out products such as Groupon+, which lets users link deals to their credit cards and get money back through their cards after they make purchases. Groupon acquired one of its biggest rivals, LivingSocial, in 2016 for an undisclosed amount. Washington, D.C.-based LivingSocial was familiar with downsizing at that point, having shrunk from a peak of more than 4,000 employees to about 200. Going forward, the goal is to move away from the voucher and attract users to its site in search of deals on everyday purchases, Williams said. But Groupon isn’t there yet. Mason moved to San Francisco within months of leaving Groupon in 2013 and released a seven-track album about business leadership called “Hardly Workin’.” He launched Detour, an audio tour startup that sold to Bose earlier this year for an undisclosed price. Now he’s CEO of Descript, which was born out of Detour and makes software that transcribes audio. Mason did not respond to requests for comment. Groupon’s two other co-founders, Lefkofsky and Keywell, stayed in Chicago. The serial entrepreneurs each founded a company now valued at more than $1 billion. Keywell, who stepped down from Groupon’s board a little over a year ago, launched Uptake Technologies in July 2014. The company, which collects and analyzes data from heavy machinery, now employs about 700 people, most of whom are at its headquarters in the Goose Island neighborhood. Uptake, which has faced its own growing pains, declined to make Keywell available for comment. Lefkofsky launched cancer-fighting data startup Tempus shortly after stepping down as Groupon’s CEO. Tempus, which is valued at $2 billion, employs about 550 people and operates out of the same building as Groupon and Uptake, the former Montgomery Ward catalog building at 600 W. Chicago Ave.
Tempus gathers and analyzes data for doctors to use in cancer treatment, and the company has plans to apply its technology to treating other diseases and to expand outside the U.S.
Lefkofsky has tried to learn from what worked at Groupon and what didn’t. It’s easy now to say what Groupon should have done differently, he said. The growth it experienced its first few years was difficult to manage. He learned to be patient and not to be short-sighted. He learned about the work it takes to control rampant growth and that the scrutiny of public markets can make that job more challenging. https://www.limaohio.com/wp-content/uploads/sites/54/2018/11/web1_BIZ-GROUPON-SHRINKING-6-TB.jpgThe customer service department at Groupon in Chicago handles customer requests on Nov. 14. The game-changing online company turns 10 as a smaller operation from its peak.